On the far right where the Batiscan River flows into the St Lawrence River one sees a land concession belonging to a St Marc. This land belonged to Louis Guillet dit St Mars. It still belongs in the family!! Louis Guillet was born in Trois Rivières on June 4th 1657. He was the sixth child, second son of Pierre Guillet dit Lajeunesse and Jeanne Saint Pere. In 1660 at the age of 3, Louis received from his godfather, Claude Houssard dit le petit Claude a donation of 50 pounds. Claude was the husband of Madeleine Couteau, his maternal grandmother. Louis spent his early years at Cap de la Madeleine. 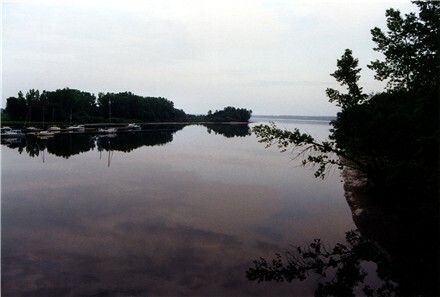 In 1666, his father obtained one of the first land concessions in the Batiscan River valley. At the age of 13 on February 25th 1671 (notary - Jean Cusson), he obtained, with his father, land on Cote Saint-Marc. Louis and his older brother Mathurin acquired land in Batiscan on May 7th 1682. On January 21th 1686, he purchased on his own, more land here. 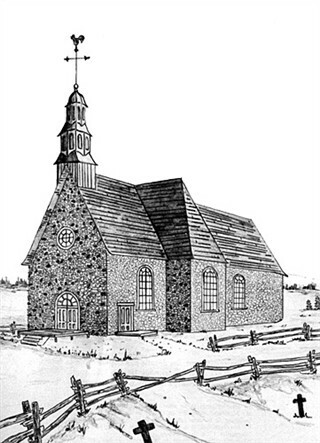 At the age of 27, he married Marie Trottier on January 18th 1684 in the church of Saint Francois Xavier of Batiscan. She was the daughter of Jean Baptiste Trottier and Genevieve de Lafond. Ten years later he started in the fur business with his brother, Mathurin and other associates. He travelled to the Outaouais and the Abitibis and according to one source also delivered merchandise in Martinique in the Carribeans. On June 13th 1695 the "Compagnie Royale" was formed. Its mandate was to trade with the Native tribes in the Abitibi, Témiscamingue region. Among the company were Jean-Baptiste Crevier dit Duvernay, Robert Rivard dit Loranger (married to Louis's sister, Madeleine), Jean Trottier, Jean Baribault , Jean Desrosiers dit Dutremble and Louis Guillet. Four months later on October 15th he sold his partnership rights to his uncle, Nicolas Rivard dit Lavigne. Louis took the name of St Marc in 1692 and St Mars in 1718. When his father passed away, his stepmother, Madeleine Delausnais transferred on July 7th 1698 an annual income from the inheritance to Louis. In October of the same year Louis transferred an annual income of his brother-in-law, Jean Baril, widower of his sister, Marie. Louis and Marie spent their lives in Batiscan. All their children were born and baptized here. 1.Marie-Madeleine Guillet, b. 1686, Batiscan, QC. 1704/05, Ste Genevieve de Batiscan, QC. 3.Marie-Catherine Guillet, b. July 26, 1689, Batiscan, QC; d.
4.Marie-Jeanne Guillet, b. January 26, 1690/91, Batiscan, QC; m.
Jean Baptiste Guyon, August 25, 1718, Batiscan, QC. m. René Messier, August 25, 1718, Batiscan, QC. March 03, 1709/10, Batiscan, QC. d. September 19, 1712, Batiscan, QC. 25, 1734, Ste Anne de la Perade, QC; d. April 07, 1790, Batiscan, QC. 10.Marie-Angelique Guillet, b. August 01, 1702, Batiscan, Quebec; m.
Etienne Biguet, April 16, 1719, Batiscan, QC. Pérade, QC; b. 1705; d. May 07, 1788.
and sold at 4 sols per minot, as is shown in the receipt book below." 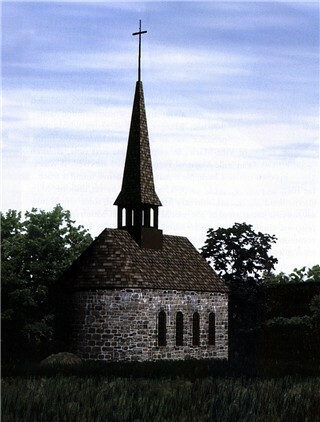 This lets us know that the small chapel had an attic that was not actually used by the parishioners but was used as a storage area. In 1724, Louis and Marie willed all their wordly goods to their children. Louis Guillet dit St Mars passed away in Batiscan on March 6th 1730 at the age of about 73. He was buried in the parish cemetery. On May 12th 1739 Marie, in the presence of the notary Pollet, dictated a will. She asked that her son, Jean Baptiste be responsible for 50 masses to be given for the repose of her soul. He should inherit her household goods. Her son, Joseph Guillet, Captain of the Militia for Batiscan was named executor of the will. Marie was unable to sign due to a hand injury. She died a month later on June 24th 1739 and was buried with Louis. 2. "Genealogie des Familles Cinq Mars et Guillet" by Roland Cinq Mars, Rougemont, PQ. the following: His descendants still have this land today. 3. Various notarized actes pertaining to him. the son of Pierre Guillet dit Lajeunesse and Jeanne Saint Pere resided in Batiscan. This is a record of events in his life through existing church records, census and notarized acts. Donation of a sum of money by Claude Houssart of Cap de la Magdelaine to Jeanne Rivard, Louis Guillet and the parish of Ste Marie of Cap de la Madeleine. Sale of land concession situated along the Saint Laurens by the Company of Jesus to Louis Guillet and Pierre Guillet dit Lajeunesse, his father. Association between Mathurin and Louis Guillet. Agreement between Mathurin and Louis Guillet, brothers and Francois Frigon of Batiscan. Agreement between Mathurin Guillet, Louis Guillet and ? Rivard of Batiscan and Jean Baptiste de Peyras, Jacques Gourdo de Quebek and Jean Rougeot dit Bergé of the seigniory of Ste. Anne associates for the voyage to the Outaouais. Marriage contract between Louis Guillet (age 26) son of Pierre Guillet and of the late Jeanne Semper of Batiscan and Marie Trotier (age 16) daughter of Jean Trotier and of Geneviève L'afon of Batiscan. Discharge by Marie Chamois and Francois Frigon, her spouse, presently absent from Batiscan to Mathurin Guillet and louis Guillet, his brother. Power of attorney between Mathurin Guillet of Batiscan as much for him as for Louis Guillet of Batiscan, his absent brother and associate and Marie-Anne Chamois, wife of Francois Frigon of Batiscan. Proxy of Robert Rivard, Jean Moreau and Louis Guillet of Batiscan to Jean Baril of Batiscan. Agreement between Jean Baptiste Crevier dit Duvernay of Batiscan, Robin Rival dit Loranger of Batiscan, Louis Guillet of Batiscan, Jean Trottier of Batiscan, Jean Baribault of Batiscan and Jean Desrosiers dit Dutremble of Champlain all associates in the Compagnie Royale. Sale of a land concession on the Cap de la Madeleine on a site commonly known as Cote St Marc by Jean Baril, widower of Marie Guillet for and on behalf of his children and with power of attorney for Louis Guillet, Robert Rivard and Madeleine Guillet, his wife, Jean Morau et Anne Guillet, his wife, Catherine Guillet and Sebastian Provencher, her husband of the Cap de la Magdalenne, Pierre Dehaye and Marguerite Guillet, his wife and Pierre Chanpuu and Genevieve Guillet, his wife of Becencour to Louis Provencher of the Cap de la Magdalenne. Sale of partnership rights in the Company created to trade with the Abitibis natives, by Louis Guillet of Batiscan to Nicolas Rivard of Batiscan. Transfer of the annual and perpetual income by Madeleine Delausnais, widow of Pierre Guillet de Lajeunesse of the Cap de la Magdelaine to Louis Guillet de St. Marq of Batiscan. Transfer of the annual income by Louis Guillet de St. Marc of Batiscan to Jean Baril de Batiscan. Marriage contract between Ignace Guion (age 25) son of Joseph Guion and of Geneviève Cloustie, of the parish of St. Charle des Roche and Marie-Louise Guillet (age 18) daughter of Louis Guillet and of Marie Trotié, of Batiscan. Sale of land situated in the Seigniory of the Company of Jesus by Louis Guillet de St. Marq and of Marie Trotié, his wife of Batiscan to Jean-Baptiste Adam their son-in-law. Sale of parts of a land concession in the seigniory of the Company of Jesus by Louis Guillet de St. Marq and Marie Trotié, his wife of Batiscan, Jean Danderelot and Madeleine Trotié, his wife of Batiscan, Antoine Germaine and Elisabeth Trotié (minor), his wife of the Seigniory of Pordneuf and Jean Trotié of St. Charles des Roche in the name of and as procurator of ?, Sister St-Joseph, sister of the Congregation, his sister to Antoine Trotié their brother. Sale of a land concession in the seigniory of St Pierre opposite Batiscan by Clément Dubois and Marie-Anne Joint, his wife of the seigniory of St Pierre opposite Batiscan to Louis Guillet son of Louis Guillet de St. Marq, his father acting for him. Agreement and transaction between Louis Guillet dit St Marq and Francois Rivard dit Lacoursière de Batiscan. Marriage contract between René Mesier-Duchaine from Cap St Michel, widow of Catherine Bisonnet and Marie-Madeleine Guillet (age 25), daughter of Louis Guillet de St Marq and of Marie Trotié, de Batiscan. Marriage contract between Jean-Baptiste Guion, son of the late Joseph Guion and of Geneviève Cloustie de Verchaire and Marie-Jeanne Guillet (age 27) daughter of Louis Guillet dit St Marq and Marie Trotié de Batiscan. Marriage contract between Etienne Bigué dit Nobert, son of the late Etienne Bigué and of Dorothée Dubois de Batiscan and Marie-Angélique Guillet (age 17) daughter of Louis Guillet dit St Marq and Marie Trotié de Batiscan. 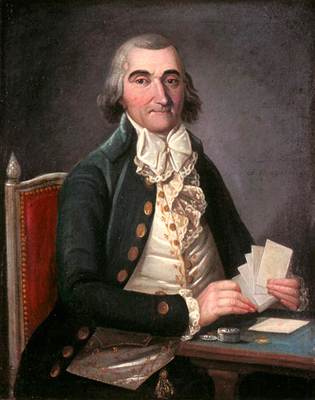 Sale of two land concessions situated in the Seigniory of Ste Anne by Thomas de Lanauguere de Laperade to Jean-Baptiste Guion dit Lachapele of Cap St Michel who is absent. Accepting for him his father-in-law, Louis Guillet dit St Marq. Sale of land in the Seigniory of St Pierre, across from Batiscan, by Louis Guillet de St Marq of Batiscan in the name of his son Louis Guillet de Verchaire to Francois Brison of the Seigniory of St Pierre. Sharing of a land concession situated on the Batiscan river between Marguerite Cosset and Jean Baribaut, her husband of Batiscan , Louis Guillet-St. Marc and Luc Proto of Batiscan in compliance with an ordinance from the Lieutenant General of Trois Rivières. 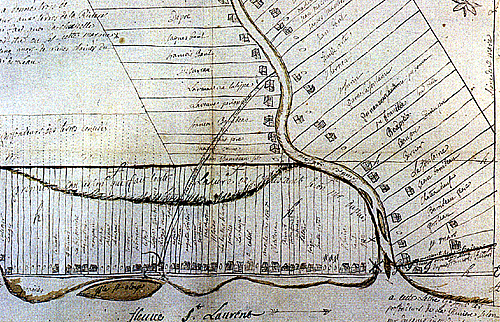 Sale of land in the Seigniory of St Pierre, across from Batiscan, by Louis Guillet de St Marq of Batiscan to Jean-Baptiste Grognié of St Charles à la Petite Rivière near Quebecq. Donation of land by Louis Guillet-St. Mar and Marie Trotie, his wife of Batiscan to Joseph Guillet, Jean-Baptiste Guillet, Jean-Baptiste Guion dit Lachapelle, Guion, Etienne Bigué, his son-in-law, Duchesne, his son-in-law, Joseph Guion and Louis Guillet. Ratification by Louis Guillet-St. Marc and Marie Trottier, his wife of Batiscan. Marriage contract between Jean-Baptiste Guillet (age 23), son of Louis Guillet dit St Mard and Marie Trotié of the Batiscan river and Marguerite Roy (age 22) daughter of the late Edmond Roy of Chateleros and Marie-Anne Janvié of Ste Anne. Burial of Louis Guillet at the age of 73. Witnesses: Nicolas Duclos and Francois Debroyeux. 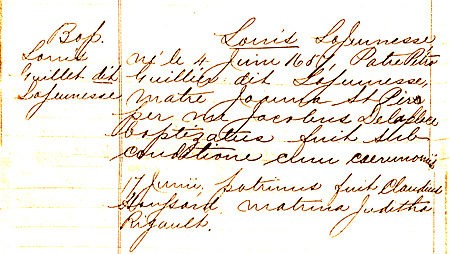 The last will and testament of Marie Trotier, widow of Louis Guillet, resident of the Batiscan river.